On Sunday, September 25, Neighborhood Legal Services of Los Angeles County brought together community advocates, collaborative partners, government officials, family, and friends for their annual Just Neighbors event to celebrate NLSLA's innovative and transformative advocacy over the past year and to garner support for increased access to justice for LA County's underserved communities. In NLSLA's 51st year, this year's theme, We March On: Stronger Together, celebrates the organization's commitment to serving the diverse communities throughout the county effected by poverty by providing its services expanding access to health, housing, opportunity, and justice. NLSLA honored Dr. Mitch Katz, Director of the Los Angeles County Department of Health Services, for his leadership and vision, which is changing lives, transforming communities, and revolutionizing the delivery of health services in the nation's second largest health system. California Senator Robert Hertzberg presented the John M. Langston Bar Association with NLSLA's Legal Excellence Award for its unwavering commitment to providing pro bono help to underserved communities in South Los Angeles, ensuring people benefit from criminal justice reforms that can improve their economic status and transform their lives. Marta Sanchez was presented the organization's Community Service Award by LAUSD Board Member Monica Garcia for her courageous leadership to protect family homes from the devastating wave of foreclosures in Los Angeles County. Marta's community advocacy efforts made national headlines as her story helped countless families throughout LA County in imminent danger of losing their homes seek help. 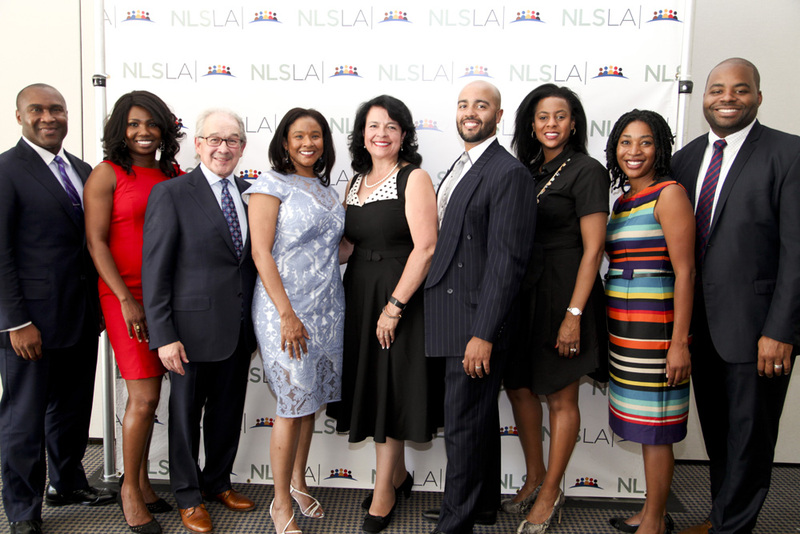 This year, with the support of Mogin Law Firm, NLSLA celebrated receiving a generous $515,000 Cy Pres Award, which will help NLSLA continue its mission to combat the effects of poverty and expand access to health, housing, opportunity, and justice in Los Angeles' diverse neighborhoods. The Just Neighbors event highlighted one of NLSLA's impactful programs: the Veterans Initiative. NLSLA’s Veterans Initiative is a collaborative effort to address veterans’ legal needs and increase their access to VA benefits and support services. Many veterans received undesirable discharges for behaviors later identified as part of PTSD or other service-related trauma. In Los Angeles County, thousands of veterans are potentially eligible for VA benefits and discharge upgrades, and NLSLA is leading the charge to assist the veteran community in these matters. Visit NLSLA.org for more information. 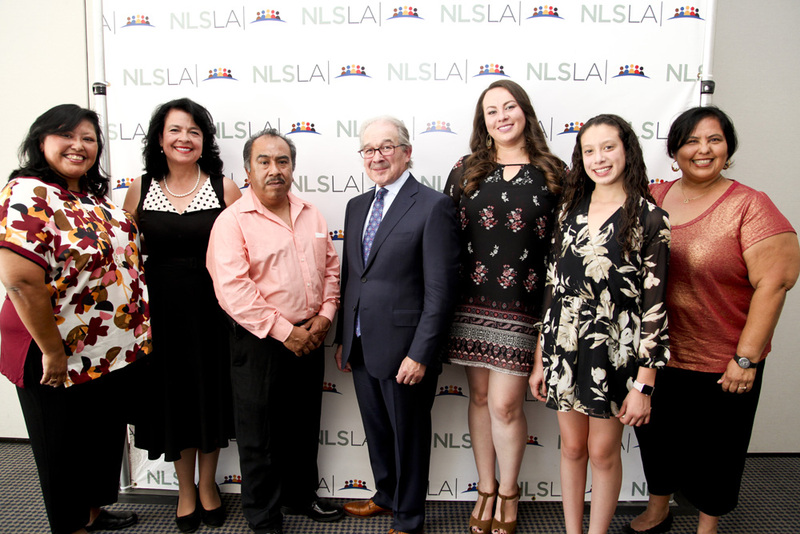 NLSLA Executive Director Neal Dudovitz (2 from R); NLSLA Deputy Director Yvonne Mariajimenez (3 from R) with Siegel, Kamenir, Reznik Families and NLSLA supporters.